Charlie Thurley, former Sutton & Cheam and Great Britain centre-forward and one of the great characters of British water polo for many years, died today (8 April) following a lengthy illness, aged 72. After joining Sutton as a youngster in 1950, he became a true colossus at the club – leading goal-scorer in National League Division One in 1965, 1966, 1967 and 1969; a key figure in Sutton’s League title success in 1967; and then coach of Sutton teams that won five National League championships between 1978 and 1990. His men’s National League links went back to 1962, when the exploratory meeting leading to the creation of the competition by eight teams, was held at the home of Charlie’s father, Charlie Thurley Senr. Charlie was an A grade referee for 30 years, coach to the Welsh national side for a decade from 1988 and a former President of the London Water Polo League. Sutton secretary Nigel Gornall said today: “Charlie was my water polo coach from 1969 and our friendship went from early days when he persuaded Sutton’s under-18 team to pay £72 to tour Beirut for a tournament – “if you don’t go, you’ll regret for the rest of your life,” he said – right through to the recent Olympics, when we pushed him around the Olympic Park in his wheelchair. 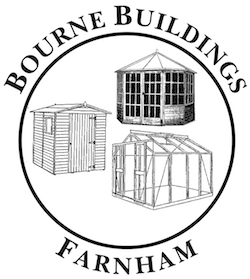 The funeral took place on Friday, 26 April, in Tolworth, Surrey. Anne Thurley, Charlie's wife, has expressed her thanks to the many people who attended and paid their respects. She also thanked BWPL for the kind words expressed on the website. The death has also occurred of former National League referee David Webzell, who was team manager of the GB team in the 1980s. He played for Enfield and Shiverers as well as running Potters Bar Imperial Toucans Water Polo Club. 50 UP FOR LEAGUE POLO IN UK! April 5 was a red letter day for water polo in the UK – the 50th anniversary of the first-ever national league match between the representative Birmingham & District League team and Otter at the Walsall pool. The men’s National League, known initially as the Premier Invitation League, had been formed the year before by eight teams – Birkenhead, the Birmingham League (now the Midland League), Cheltenham, Otter, Polytechnic, Sheffield Dolphins, Sutton & Cheam and Weston-super-Mare. Of those, current champions Cheltenham, Polytechnic, winners on no less than 17 occasions, and Sutton hold the proud record of being the only ever-presents to this day. I do not know if this story is true or not, but once upon a time the New Ferry baths manager had a magic thermometer! Every Easter, when the pool opened, we would ask him what the water temperature was – and he would respond, “what do you want it to be!” In 1963, we’d suggest 55 degrees and, sure enough, that’s the temperature that would go up on the board the next day. However, certain teams did not believe this and brought their own thermometers, which were always “wrong” – usually 53, while mine said 57! Referees, using their intelligence, would then call for the official thermometer and, of course, it would show 55 (the official minimum temperature for water polo at the time). Game on! When subsequently the League raised the minimum temperature to 60 degrees, the magic thermometer was still doing its job – always showing 60! Players like Neil May and Jon Towers (both ex-internationals from Polytechnic and Otter respectively) will tell you that, once you got used to it, it was quite pleasant. Mind you, Phil Shailer (Polytechnic secretary in the early days of the League) was not convinced the day Neil got deliberately lost and he had to go in goal. Our manager and coach at Otter was Eric Kimber, who assisted in setting up the League, which was much frowned on by the ASA in the early ‘60s for all the usual ‘dinosaur’ reasons. Eric was a building engineer who drove our team all over the country despite a heavy workload as site engineer at the building of Regents Park Mosque. He once quipped as we overtook and squeezed between a lorry and an oncoming tram somewhere in the North: ‘You should know that the sides of my car are completely flat and I know very well the overall width of this vehicle!’ The three passengers remained very quiet for several minutes! One of the hardest competitors I remember from those days was Corporal of the Horse Tom Hudson, a well known International pentathlete who played for Sheffield – a player who hurt just by being within 5ft of you! Sorry to hear of the demise of Charlie Thurley. I played with him in England under-21s under coach Gerry Worsell – Charlie was a star full-back before becoming a lethal forward. His brother John was a swimming international and Olympian. Playing once in Crystal Palace against Sutton, their mother, who was a bit of a firebrand, was so enraged by the treatment of Charlie (in the hole) that she threw a metal clip board from the balcony at Neil Payne, one of our backs, hitting him on the nose and retiring him for stitches at a local hospital. The story from Mugs Murray about the cold Birkenhead pool is absolutely true – every time we played there we lodged a complaint about the temperature. I don’t think we took it further than locally; we had after all been travelling hours to Birkenhead and it would be many hours before we got back to London, let alone our own homes! You can read much about the early days of league water polo – including the chilly challenges of playing at New Ferry – by clicking on this website’s NWPL History page. More than 60 delegates attended the British Water Polo League’s 4th annual meeting in Birmingham on 24 March, when tributes were paid to outgoing Match Secretary David Boot, who is retiring after 20 years’ outstanding service. It’s a measure of David’s contribution that he will be replaced by a team of three, comprising new Match Secretary Chris Stephens, of Iceni; James Reddick (Polytechnic), who has created and will operate a splendid new online registration system; and Paul Costello (Tyldesley), who deals with statistics. A presentation was made to David’s wife, Beryl, to acknowledge her great support for the League. Gordon Dacre (Liverpool) ended his three-year stint as President by presenting trophies, medals and pennants to winning teams. The new President will be former Great Britain international Pippa Jones, one of the driving forces behind the foundation of the former Women’s National League and now a leading coach and administrator. Chairman David Andrews led a discussion about the role of the British League and the challenges faced by water polo in the UK as a whole in the aftermath of the Olympics. BWPL Life Member and former ASA President Philip Jones was presented with the League’s Michelmores Shield, which is awarded annually for service to the League and the sport in general. It is half a century since league water polo began in Great Britain – with Philip as founder secretary of the original men’s Premier Invitation League. The following information/advice has been supplied to the British League by the British Swimming Delegates Group and should be noted prior to the new season. Referees are to issue a red card (in addition to making the prescribed hand signals) to a player excluded for an offence under WP 21.10 (Misconduct) or WP 21.11 (Brutality), as described in the FINA Water Polo Rules at Appendix A. [Note: the failure of a referee to show the red card shall not affect the imposition of a sanction under the ASA Water Polo Disciplinary Regulations]. 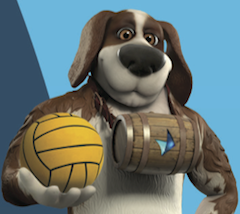 Time outs must be requested by the head coach in accordance with the FINA Water Polo Rules and Instructions. If there is no head coach, another team official on the team bench may request the time outs. If there is no other team official on the team bench to request the time outs, any team member may request the time outs. It is confirmed that a player cannot act in the capacity of head coach or any other team official (or vice versa) in any match. By way of clarification, vocal encouragement for a team, including celebrating goals or good play, by substitutes on the team bench is not to be construed as “coaching” or misbehaviour and is not to be discouraged or sanctioned by referees or Delegates, unless it is considered to be excessive. Referees are to check that players have removed any articles likely to cause injury, and do not play with uncut fingernails. Inspections are to be made prior to every match, without exception. Former Cheltenham and Great Britain captain Peter McGonagle has died at his home in Baja, Mexico, aged 79. He moved from Scotland to live in Cheltenham after starting an apprenticeship at the Smiths factory (later Smith Aerospace) and starred in a local team that dominated English water polo in the years immediately prior to the launching of the men’s National League in 1962. 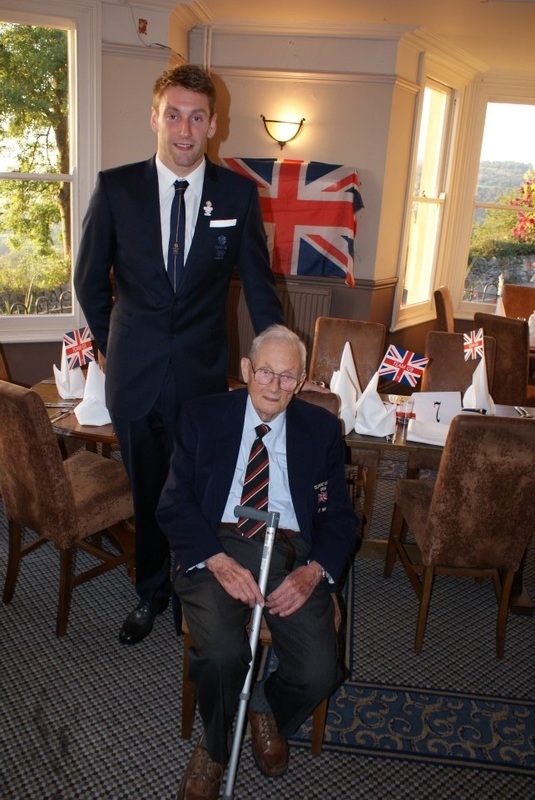 Former team mate and ex-GB international David Wright said: "We were all very close as a team. I first met Peter when I was 13 or 14 years old and he was already established in the first team. I looked up to him and he took me under his wing. He was a great captain who led by example. As a friend and captain, you couldn't ask for more. "We were the Manchester United of water polo in those days and a lot of it was down to the leadership." Peter leaves behind sons Peter, Iain and Sean and daughter Kirsten, all of whom are in the United States or Mexico. He is pictured third from left in the back row of a famous Cheltenham team. The other players (back row, from left) are Philip Jones (a Life Member of BWPL and founder secretary of the men’s National League), Doug Auchterlonie, goalkeeper Keith Philips, who passed away recently. Front: David Wright, David Taylor, John Wood. The death occurred on 17 January of David (Jimmy) Giess, whose impact on the development of Midlands water polo had been immense for many years. As recently as 2010, he received the ASA's Aquaforce Award for his contribution to the sport. David was always fondly known as "Jimmy" or "Jim" as player and official. Apparently, in his youth, there was another player named David in his team and so he took his second christian name, James - and it stuck. In the 1970s, Jim was instrumental in setting up the former Nechells water polo team, which competed in the Midland and Birmingham Leagues as well as the men's National League. By the mid-1980s, he was a key figure in establishing the City of Birmingham Swimming Club. The polo team competed in the National League for a number of years before dropping out in the mid 1990s, but Jim remained as ambitious as ever for future success in the region, becoming the driving force behind development of City of Birmingham youth and junior sides, which competed in ASA national age group tournaments. This laid the foundations for Birmingham's return to the NWPL in 2006. Many players will acknowledge the huge influence that Jim had on their lives. Generations have been inspired by his drive and dedication to the sport. He was very active in the Midland League - as junior and women's secretary, then as youth secretary. He was League President in 1985. The funeral took place at Perry Barr Crematorium, Birmingham, on 30 January. Great news for GB girls – their funding leading up to the Rio Olympics in 2016 has been increased to £4.54 million by UK Sport. And the men? As feared, they get nothing, although British Swimming has since confirmed that GB men will still be entered in the LEN European Championship qualifying competition, which begins as early as April with a match against Georgia. The writing had been on the wall for the men since October when British Swimming presented to UK Sport its Project Rio, which focused on GB prospects of qualifying for 2016. UK Sport had said from the outset that funding had to be targeted towards those likely to make the grade – rated “credible” for the women’s team but “very difficult” for men. By December, there was a “provisional” plan to withdraw all funding for the men’s international programme. The coaching team lost their jobs; financial support for the players ended at the start of the month. BWPL received dozens of comments from all over the UK and beyond following the first news of the imminent cuts. See next item. GB MEN’S FUNDING CUT – WHERE NOW IS THE ‘LEGACY’? Ed Scott, GB Olympian 2012: It seems all the hard work we have put in over the last six years to raise the profile and standard of polo in the UK (which I think we can confidently say has happened), has now come to nothing. I have spoken to a number of players and they feel the same way. We knew after the Olympics that a funding application would be made to UK Sport in November for the next Olympic cycle leading to Rio, but we were only able to apply based on a potential podium' level – the lowest level of funding as there was no more 'development funding' available. It appears we haven't been granted this. But what I didn't realise was that, if this money wasn't there, it would mean the end of our national team! We used to go away as a national team in the past without UK Sport money. I thought at least we would still have a group of players playing in Europe and would enter the Europeans. Obviously I was wrong, but then this wasn't communicated to us. We were under the impression that everyone would go abroad again and the programme would continue to run as in previous years – with qualification for the Europeans as our next goal. The future of our team at the moment looks grim. If we are to do anything about it, we have to act now – and quickly. We have just come off the back of the most successful Olympics in our history and must use that to generate some form of interest to keep our team running. UK Sport gives out cash dependent on performance and results, but we need cash to develop more and TO ACHIEVE these results. So unfortunately we're stuck in a vicious cycle. Unless their policy on allocating funding changes we won't receive anything – unless we can get some money from other sources? Phil Howden, ex-GB captain now resident in Australia: Unbelievable, but typical! Nothing has changed in more than 30 years - I’m glad I am here. BJ (Phil’s son and one of Australia’s best young players) is in Barcelona training with CN Barcelona (one of Spain’s top clubs) funded by Queensland Academy of Sport. Slightly different tack from the ASA in looking to the future . . .
Adam Scholefield, GB Olympian 2012: The recent announcement was very disappointing, although not surprising. There have been many attempts to disband the men's team and we wouldn't have been at the Olympics without the support and stubbornness of Friends of Water Polo, so a big thank you to all involved! I think this battle for survival is a recurring theme that nearly every generation of GB men's team has been through. As for the future, playing abroad, in the short term, provides a way for players to play at a high level and be funded to train full-time at minimum cost to the national team. While there are a reasonable number of players prepared to do this, it's criminal that there isn't enough funding to enter competitions as I'm sure a reasonable team could be put together combining players based both domestically and abroad. Longer term, without incentives such as an Olympics, the number of players prepared to commit to playing abroad will always be limited and therefore the success of the national team is dependent on the domestic set-up. Currently, I think the BWPL is an incredibly well-run league but at the end of the day it's a social league and doesn't promote performance. British water polo has to decide whether it wants to continue providing a great social experience or make the necessary changes to compete with the best teams in Europe. In recent years, the league has made every effort to improve and innovate but it's hindered by the baggage of too many opinions resulting in the dilution of good ideas. If we are to really progress it will take a radical rethink from a few focused people and the support of the majority of the water polo community. I will finish by saying that, having experienced water polo in the most successful Olympic water polo competition of all time, I really believe it's possible – if we collectively move in the right direction – for GB to win an Olympic medal in the next 25 years. Jack Waller, GB Olympian 2012: I think it is a massive shame after we have had the most successful years for a very long time in British water polo history. I thought we as a young bunch of guys had a lot more to offer and could start to push some of the top nations. So much for the Olympic slogan "inspire a generation" and "making a legacy" for water polo. We have done it before without any funding and I'm sure we can do it again. The whole water polo community needs to get together and be positive about how to improve the sport in our nation. Frances Lawlor, Friends of Water Polo: Friends of Water Polo were asked in 2009 to raise £24,000 over six months to provide the GB men with £250 per month each for six months. It sounded easy but wasn't. In fact, it was one of the most stressful times of my life. Towards the end of the six months, we raised the funding by the skin of our teeth – I had sleepless nights not knowing where the next £1 was coming from. Virtually all the fund was from parents of the 89 boys or others connected with that squad. Other promises of funding were not honoured. So what I am saying is beware of thinking that funding is easy to raise if you want to break away. We struggled even with the lure of the Olympics. £24,000 is a drop in the ocean for the overall funding of the sport and these are difficult economic times. It is sad that there is to be no legacy but realistically the writing has been on the wall for a long time, with the 91 and 93 squads disbanded and the Divisional Championships gone. Young people who are talented athletes often have more than one sport to choose from and they won't choose water polo if there is no national team at juniors or seniors to aim for. The Friends of Water Polo Bank Account is still open. If anyone wants to take it over (the trustees are Dave King, Dave Waller and myself) they are most welcome. We looked at Charitable Status which wasn't available for funding elite athletes but might be if grass roots level is included. Good luck with whatever the sport decides to do. Nigel Gornall, Sutton & Cheam: Yet another mind-boggling decision by our beloved leaders at the ASA. ASA Code of Ethics - "Respect the rights, dignity and worth of every person, be they adult or child, treating everyone equally within the context of the sport" - applies unless, of course, you are a male water polo player. On the basis of only having potential medal winners at Rio in 2016, Team GB should be able to hire a 100-seater RyanAir flight to take all the competitors and officials. One day, this country will wake up and support our sports instead of those who scrounge off the benefit system week in, week out. Now must be the time the water polo community look at taking their destiny in their own hands and follow Australia in forming a water polo federation. Dave Partington, Birkenhead: A great disappointment, but no surprise. When we were awarded the Olympics in 2005, British Swimming missed a trick because, instead of encouraging more people to play the game, it discouraged participation – unless it was at a Regional Training Centre or for people who bought into training in Manchester and opted out of work or studies. In Manchester, players trained with a foreign coach who picked those who opted into the scheme rather than the best. So no Scott Carpenter, no Tom Curwen, no Mike Cowburn, three of the best players I have seen. The structure of water polo has been decimated by GB/ASA in the past seven years, cancelling the inter-districts from which national teams used to be picked, ending the county junior championships etc. Even the Deep Water Championships (now British Championships) were reduced to a round-robin format and scrapped for a knockout finals day. I said at a National League meeting many years ago that whilst we our under the ASA/GB banner, our sport will be in the doldrums. Until water polo opts out and goes it alone as Australia did, lottery funding, television revenue and sponsorship will never be put back into water polo. It’s a big task but for our sport to survive it has to happen. Trevor Hyde, 2012 Olympics water polo official: So we've lost a good water polo pool in London, and now the men's team has lost its funding – so much for the legacy for our sport. Kieran Bayles, Sutton & Cheam, currently working in Australia: Near the conclusion of the London Olympic Games, Sir Steven Redgrave wrote about how “we need to be able to engage more with children passionate about sport, to harness the phenomenal enthusiasm generated during [the Olympics]”. He also explained that we need to widen the potential areas of success, not narrow them. Undoubtedly, the Olympics provoked great interest in a number of sports - through excellent media coverage, British successes and the fact that the British public attended events with which they were previously unfamiliar. In line with this, my local club, Sutton & Cheam, has seen attendances double at its sessions at local schools – great news for a small club that has produced 10 Olympians in both swimming and water polo. It is also great news for a sport that was invented in Britain but no longer flourishes here as it once did. confidence that everyone involved was very proud of their performances. I was devastated to hear the news that funding for our men’s team has been cut – completely. This stark and abrupt abandonment is disgraceful treatment of the young people who helped bring our nation to life in August. How is that for legacy? I understand the difficulty in allocating limited (and shrinking) funds to an increasing number of successful sports - it is basic supply and demand. However, we should reflect on the words of Lord Sebastian Coe in delivering our successful bid for the 2012 Olympics. He spoke of events that inspired him eventually to win Olympic gold in 1980 and described watching two local athletes winning Olympic medals on television, and aspiring for the same. What is there to aspire to for young people who can see a governing body hanging a sport and its athletes out to dry? After a 56-year wait for a GB men’s team to rebuild itself and look to return to former glories, why would its governing body, at this pivotal moment, choose to allocate zero future funding based on an unlikely chance of qualifying for Rio 2016? Only 12 countries qualify for the men’s competition. However, many other nations that did not qualify for London (including France, Germany, Holland, Greece, Canada, New Zealand - the list goes on) continue to fund their international programmes. Why pull the rug from under our feet at this key moment? Thriving and successful sports take years to build, but moments like these can condemn them to extinction much more quickly. Water polo’s governing body just made that choice for our sport. Water polo isn’t asking for much – but asks for more than zero. Surely, that isn’t too much? Jon Hilliger, Invicta: How much did the swimmers get in funding for 2012? Did they achieve what they were expected to for that amount of funding? NO! But I suppose they will continue to throw money at them and continue to forget the minions. Tim Whitwham, coach: I hate to say it, but I told everybody so. Like Icarus, GB water polo has flown too close to the sun without being ready for it and it will take a long long time to get anywhere near it again. The U19 girls, although given a World Junior spot, got battered in the Euro champs and it's the rest of the world that dominates in the women's game. Further, the funding they get will be nowhere near as much as for London where we were more or less guaranteed a place. At least the men have more chance of playing regular polo through the European Leagues and that will ultimately be all the girls will able to do as well. James Baker (General Secretary) and Fred Fowler (Chairman), ASA South West WP Committee: Those responsible for investment decisions over the past 4-5 years have failed to ensure there would be an enduring legacy. A key opportunity was missed in not insisting that players benefiting from the bulk of the investment and competing in the Olympics were contractually obliged to be involved in development/coaching of future generations for a period of time afterwards before pursuing their own ambitions abroad. Cutting funding for GB men is counter-productive to the sport as a whole, providing no focus for the ambitions of younger age groups. The decision is also symptomatic of the way the sport is managed within England Talent – the 'chop and change' attitude to development of different age groups (for example, cutting 1994 Year of Birth and 1997 Year of Birth) provides no continuity of young player development. This will inevitably lead to a decrease in the pool of talented individuals for future GB teams. Why not maintain training for all age groups, albeit on a reduced basis? At least continuity would be preserved. And young players would not become disillusioned. Wider questions need to be asked regarding the RTCs’ failure to produce an adequate succession of young players of a sufficiently high standard to ensure funding is made available to deliver what we were promised – “the world’s number one development programme by 2018.” The upshot of all this is that many well-known figures within the sport no longer have confidence in England Talent management or the ASA to provide a professional and adequate development pathway. We are concerned that so many high profile and well-known figures are not prepared to put their heads above the parapet and air their views publically for fear of upsetting working relationships within their clubs/regions as well as potentially jeopardising their own careers and/or players associated with them. We find ourselves torn between trying to promote the sport we love, and agreeing with the increasingly widely held view that in all likelihood players should not consider the investment of their time, effort and finances in a pointless pursuit of attaining high level representation. Robert Williams, South Derbyshire: Sorry, but you need to look at the bigger picture. Many British sports receive NO funding, yet function. Total funding is being cut across all sports, not just water polo. Solely funding the top level was never going to be sustainable and it would not grow the sport. Grassroots investment is needed, good quality coaches bringing more players through with more teams in competitive local leagues. BWPL will then be an outlet for the top clubs. Regional team competition could also be investigated. Callum Bailey, Invicta: I think everyone knew this was going to happen. A pool of talented players who have worked hard for the past five years and were hoping to continue this legacy now have nothing to look forward to. Very disappointing. Ian Melville: Very disappointing, but somehow not surprising. Wonder how the hugely under-performing swimmers will fare? Former Lancaster and GB star Scott Carpenter is now a big name in Australia – as confirmed by his selection to play for an International All Stars team against the Australian national side at Bondi Beach, Sydney, on 4 January. His teammates will include triple Hungarian Olympic gold medallists Tamas Kasas and Tomas Molnar, Maurizio Felugo and Deni Fiorentina from Italy’s World champions team and Tim Hutten, Olympic silver medallist with the US. Scott (pictured here, third from right in the back row in an Australian League All Stars line-up) describes the occasion as “a bit of fun – an annual exhibition game introduced to market water polo to a broader Australian audience and give the sport some exposure. “They do a great job here marketing to businesses and celebrities to reach a demographic that wouldn’t normally watch water polo. I’m not focusing on my teammates too much because I think we have an inferiority complex in Britain that we don’t belong in the same pool as these players. Scott moved to Australia in 2009 after a stint in Spain and lives in Melbourne. He was leading goal-scorer for Richmond in the Victoria State League last season, receiving the competition’s Most Valuable Player accolade, and will shortly start a new Australian National League campaign with Victoria Tigers, last season’s runners-up. He says: “Life in Australia is great. To be playing sport for a living in a country that loves sport so much is perfect and it's nice to be looked after for playing water polo. “The people here are amazing and they've been so welcoming. Even though I live in the centre of Melbourne, everyone's always so relaxed and smiling. I'm really lucky to be in a great location with the beach, pool and city all on my doorstep. My apartment is also above the biggest shopping complex in the state with bars, a casino and cinema so I have to be careful how often I wander down there with my wallet. "I'm currently waiting for confirmation that I can be sponsored for Permanent Residency by the Australian Olympic Commission, so fingers crossed that works out. “On the water polo side, everything is there to help us play well. The standard of the National League and the Victoria Tigers training sessions is excellent. There's a big emphasis on swimming and conditioning which suits me as I was brought up that way at Sedgefield and playing for Lancaster. “Convenience is a big part of everything too. It doesn't seem like a chore to go and meet for a coffee, go for a swim in an open-air 3000-seat stadium (Victoria Tigers home pool is the 2006 Commonwealth Pool), and then walk inside to a brand new gym at the Victorian Institute of Sport. It's just a really pleasant environment to train in. Scott enjoyed some great seasons with Lancaster, topping the men’s National League goal scoring list in three consecutive seasons and setting a record of 109 goals in 2007. The record had stood for 20 years and he ousted someone very close to home – his dad George, who totalled 105 for Durham. Scott is disappointed – but not surprised – to hear about the loss of funding for GB men, especially as he was one of the first players involved in the pre-Olympics squad in 2006. “As far we were concerned, London 2012 wasn’t ‘the start’ or a ‘building block’ towards Rio, it was the absolute end goal and the culmination of six years’ work. We always knew that a post-2012 ‘cliff’ awaited due to our GB junior teams being disbanded. The legacy plan simply didn’t exist. “All the administrators ever worried about from 2009 to 2012 was having a men’s team appear at London 2012. Performance and personnel were virtually irrelevant, as long as they could tick the box. Postscript: The International All Stars went down 9-8 to the Aussie national team in the special match at Bondi Beach. David Welshman, a referee in the former men's National League for many years, died on 3 January following a short illness. David lived in Milehouse, Plymouth, and had a lifelong passion for water polo. After his retirement as a referee, he regularly attended NWPL and BWPL weekends as a spectator. He was also a strong supporter of the Bristol & West League and was particularly proud when the committee of that league created the David Welshman Trophy in his honour - presented annually to the Premier Division champions. The funeral took place on 17 January. There's been much talk recently regarding the youngest player to appear in the British League (see Youngsters Make Their Mark - below). So what about those who are somewhat longer in the tooth? Chris Mann, of Old Whitgiftians, made a bid for the title of oldest BWPL player when, a month after his 60th birthday, he played in the club's 9-8 Championship 4 victory over Invicta Marlins at Walsall on 9 December - his first game at this level since the 1980s. Old-timers from the former men's National League will remember Chris as a key member of Old Mid-Whitgiftians (OMW), playing in the National League when the club joined Division 2 in 1972 and starring in a team that was undefeated and won promotion to play one season in Division 1 in 1975. Another golden oldie is Mark Coles, who helped out 2nd City Birmingham as stand-in goalkeeper at Walsall (13/14 October), his first appearance in national league water polo for a mere 36 years. Mark last played for Leamington in the old men’s National League. Since then, he has turned out for Camp Hill Edwardians, who currently play in Division 2 of the Midland League. BWPL table officials’ organiser Sharon Worthington has celebrated double success – winning the Staffordshire ASA’s M G Evans Memorial Trophy as well as a Black Country Consortium for Sport award for achievements in water polo. The ASA trophy is awarded annually for performance considered “the most meritorious of the year” and recognised Sharon’s service as a water polo official, including her selection as an Olympics tabler at London 2012. Appropriately, it was presented by the Staffordshire ASA president – BWPL referee Geoff Kirkham! 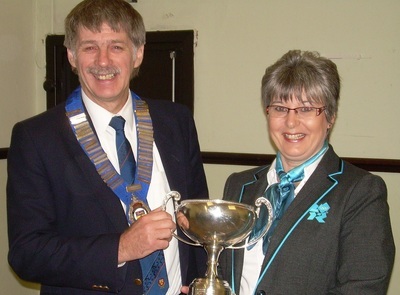 Bristol Central Swimming Club had much to celebrate at their annual dinner-dance this year! It was the club’s 75th anniversary. And there to mark the occasion were five of the seven members who over the years have represented the club at the Olympics. 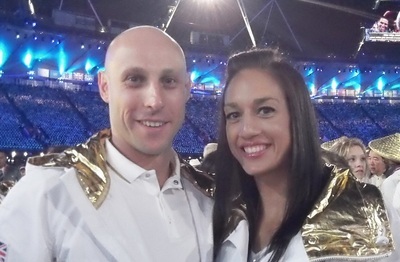 Leading the way were two 2012 athletes – water polo captain Craig Figes and sychro team member Katie Dawkins (pictured together at the opening ceremony in London). Central Olympians of the past are swimmers Grace Isaac, nee Wood (1952 Helsinki) and Linda Amos (1964 Tokyo), plus synchro representatives Caroline Francis, nee Holmyard (1984 Los Angeles), Nikki Shearn (1988 Seoul) and Natasha Haynes (1992 Barcelona). Central rightly took great pride in celebrating the latest Olympic double – especially as Katie and Craig are very much products of the club’s junior section. Katie joined at the age of 12, after starting out as a gymnast. Craig’s passion for water polo began at the age of seven when he often remained in the shallow end after swimming training to practise eggbeater and throw a ball around while older players trained at the deep end. It was all to lead to a fabulous international career spanning 20 years – 19 as a member of the senior GB squad and eight as captain. Watford Water Polo, in association with ASA London Region (North), jointly funded a visit to Rome for 26 junior players during the October School half-term. The young squad, led by team manager Nikki Baker and assisted by head coach Nik Jovanovic – plus two Level One coaches – spent eight days training at the Ostia Federal Center, where facilities include 50-metre indoor and outdoor pools as well as a gym. Apart from one rest day, reserved for a sightseeing trip around Rome, the squad’s daily programme featured double training sessions, gym work and friendly matches against Italian club sides. Watford also split into under-17 and under-15 age group teams for a round-robin international tournament involving Italian clubs Acilia WP, ASD Village, CC Lazio, Racing SCN and Akrosport. BWPL’s first conference, held in Sheffield (28 September), was a big success, with more than 50 club representatives, referees and other officials attending. Sky TV: It was hoped that BWPL Super 5s action would again feature on Sky Sports this season. The League had linked up with an agency aiming to raise sufficient sponsorship to cover programme production costs. Referee Assessments: Clubs to continue the practice of assessing referees, as agreed at the recent AGM. Facebook/Twitter: All players and club members encouraged to join Facebook/Twitter via the BWPL website. Busy social network sites encouraged potential sponsors. Delegates: For the first time this year, delegates now present at all divisional weekends. England Talent: Clubs reported they were losing players to England Talent training despite procedures being in place to secure their release when BWPL weekends occurred. Issue to be addressed further by the League. Time wasting: While the time-wasting rule no longer applies, FINA had clarified that possession would be changed if a player declined to keep play moving by passing or swimming with the ball. Structure of BWPL season: Some representatives favoured extending the season into the New Year; and/or starting later in September. For further discussion. Calendar: League to work with ASA to ease calendar overcrowding. It’s not only water polo veterans who are making the news . . .
Postscript: Matt's story prompted a new (unlikely to be beaten) challenger for the youngest-ever National League goal-scorer! She's none other than GB Olympian Francesca Clayton. Fran, now playing for top German club SV Bayer 09 Uerdingen (as well as Liverpool) was just 11 when in January 2001 she turned out for Harrogate in the former Women's National League and was among the scorers in a match in Manchester. PPS . . . Ben Goddard, just 14, has been showing exceptional promise with Worthing, scoring three times in matches against Birmingham and Cambridge at Ponds Forge earlier in the season. 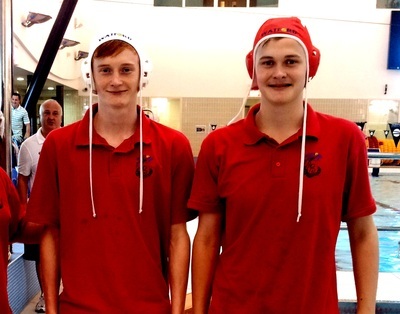 With players like Matt and Ben making their mark, who says there isn't a great future for GB men's polo? PPPS . . . we can add to that list twins Jack and Peter Pickford, aged 15, who achieved the unusual distinction of both making their BWPL debuts for Watford during the Division 4 weekend at Surrey University. The brothers (pictured) are currently taking part in Watford's youth venture in Italy (see above). Iceni's promising youngsters include Dani Brazier, just 13, who made her mark in the recent women's Division Three weekend at Marlborough with seven goals in three matches. Dani didn't start playing until last January, but already is attending England Talent sessions. Well done Dani! Kamz Powell, 14 in June, is one of a batch of promising youngsters at Exeter. There are not many lads of that age who would relish making his BWPL debut in a 30m Division Two pitch, but that's what he did at Gloucester recently, scoring in the final quarter against Croydon. Kamz started playing at Exeter aged just six and developed to be lead goal scorer in county and regional competitions at under-15 level - an age group in which he can still compete! Exeter's coach Chris Waller praised his efforts in the Croydon match - "he played sensibly throughout the match and didn't make any errors - a very encouraging sign at such a young age." The RAF successfully defended the Inter-Services Championship for a record 8th year at Portsmouth (28-30 September). They beat the Army 13-10, thanks to a tense fightback in the later stages, but then succumbed 9-7 to the Royal Navy, the RAF’s first defeat in 16 Inter-Services matches. It meant the title was settled by goal difference. The team have expressed their thanks to BWPL and its members for their continued support, particularly South Derby, City of Sheffield and Watford for providing opposition throughout the year and in the week preceding the competition. British League chairman Dave Andrews today echoed the sentiments of water polo fans across the UK when he praised the “phenomenal” performance of our men’s and women’s teams at the 2012 Olympics. “OK, we are not celebrating any victories. But that’s not the point,” he said. “Despite all the well-publicised difficulties surrounding funding – or lack of it – together with other issues, both teams have performed brilliantly and beyond all expectations of even the most ardent of supporters against highly-motivated professional nations with many more years of high-quality preparation behind them. “No one could have asked more of our boys and girls in the skill, determination and courage they demonstrated. “At BWPL, we like to think we have played a small part in the success because all players have in a sense graduated through the league. Someone like Joe O’Regan, for example, was playing for Manchester Hawks in the lowest men’s division only about three years ago. Congratulations to City of Manchester chairman Mike Glover, a Life Member of BWPL, on the award of an OBE for Services to Water Polo in the Queen’s Birthday Honours List. Mike has been the driving force behind the development of the City of Manchester club over a number of years. He was recently involved in the creation of a new partnership between the club and Manchester City Council which will see coaching programmes introduced across the area. A primary and secondary schools water polo league will be created and community water polo clubs supported in Harpurhey, Moston, Wythenshawe and Gorton. Peter Pass, M.B.E., arguably the greatest British water polo player of the post-war years, died peacefully in his sleep on Sunday, 3 June, following a short illness. He was 79. A former chairman of the men’s National League – between 1983 and 1987 – Peter’s international career spanned 15 years, including the 1956 Olympic Games in Melbourne. As a player, and then coach, he was a key figure in the outstanding success of the Polytechnic club, winners of 17 NWPL titles between 1964 and 1994. Peter’s friend Neil May, the former Poly and GB goalkeeper, writes: “Peter joined Polytechnic in 1949 – as a goalkeeper. Due to a lapse of rules that year, he scored seven goals in a match from that position. From that point, it was clear he was wasting his time as a goalie and, after selection for the first team in 1950, he remained the first player on the team sheet until his retirement in 1970. “Peter therefore played in the first team for 21 consecutive seasons, an absolutely fabulous achievement. For virtually the whole of this period he was recognised as probably the most outstanding payer in the country and certainly one of our few players of world class. “When Peter came into the team, Polytechnic, despite being one of Britain’s leading clubs since 1894, had never won a national title. It was due to his influence that the club went on to dominate the sport so many years. “Peter’s last games for Polytechnic were in Sofia when we took part in the European Cup against such clubs as world champions Zagreb. Even in this late stage of his career, European officials noted him as one of the tournament’s outstanding players. “Peter’s international career was equally outstanding. He was first selected for his country in1955 and took part in his last international match in 1969, earning a then record of 95 caps. This included the 1956 Olympic Games in Melbourne, the 1962 European games in Leipzig and the 1961, 1963 and 1965 West European Games. “This success was brought about by his absolute dedication to the sport and, until the very end of his career, he made the effort to train twice a day every day. “Upon his retirement, Peter took over as Polytechnic first team coach and so the tremendous knowledge that he had accumulated over the years was ploughed back into the sport. “Peter was awarded the M.B.E. for services to water polo in 1971. On a personal note, Peter was a wonderful friend and it was a joy and a privilege to play alongside him. 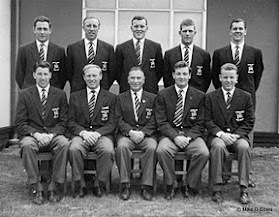 In the picture below of the GB 1956 Olympic team, Peter Pass is pictured on the far left in the back row. If you wish to comment, please contact Neil May, neilm30@googlemail.com.